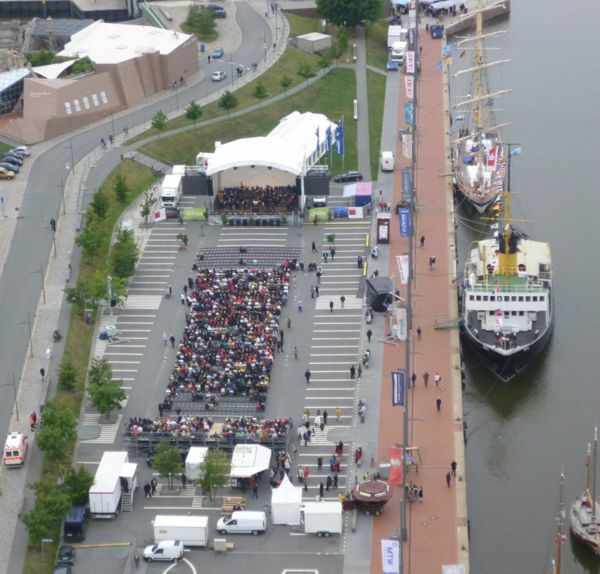 June 2011- On 17 June this year the “Opernnacht am Meer 2011” took place in Bremerhaven. 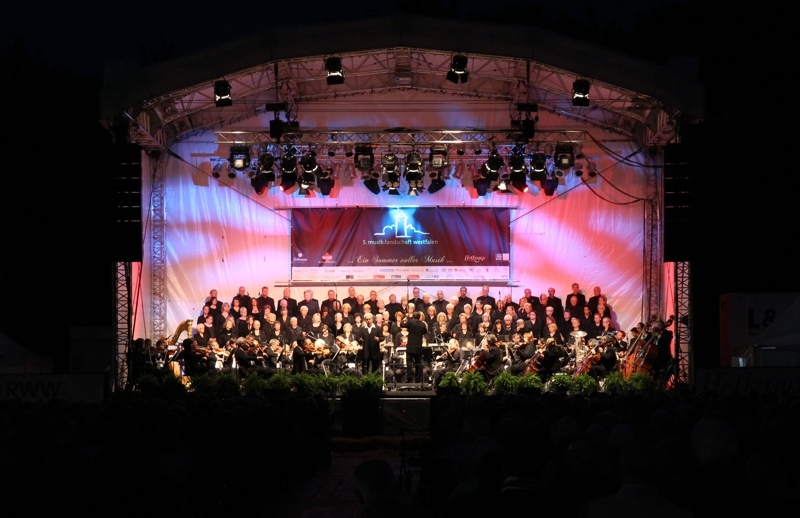 Around 1,600 guests experienced the most beautiful arias from operas by Verdi and Puccini in a maritime atmosphere. The ships around and the Simon-Losche lighthouse on the west side of the new harbor provided a pleasant background and a special atmosphere of the open-air concert. Soloist ensembles and various choirs cared for the Mediterranean opera literary. L&S provided a 140 square meter, filigree stage for this special event. 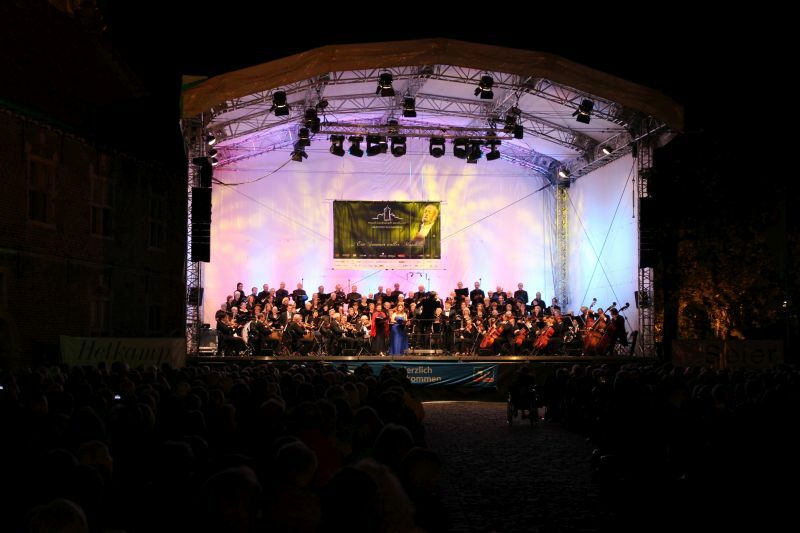 The ArcoStage 140 impresses with white foils and its round arch optics and is perfectly suitable for classical concerts and operas. Furthermore, we provided a LED wall so that even the guests in the rear rows had an excellent view of the artists. 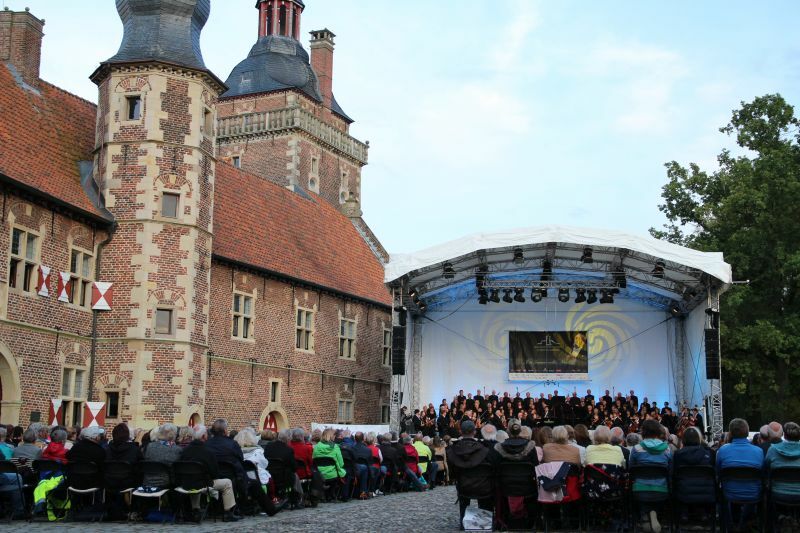 The conclusion of the Opernnacht: a completely successful event with a good background! 20 years DBU in the dbb-Forum Berlin! 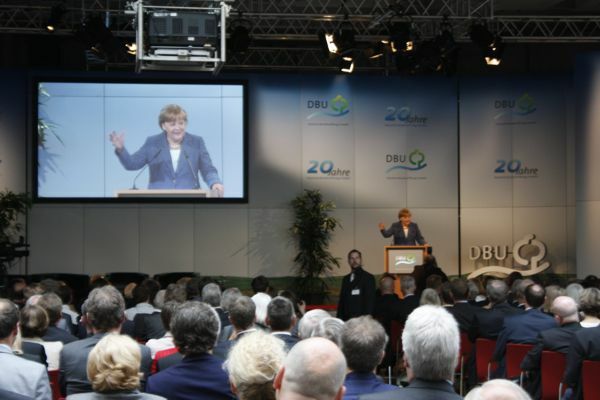 „20 Jahre Deutsche Bundesstiftung Umwelt“ [“20 Years of the German Federal Foundation for the Environment”]: May 24, 2011, on the occasion of its 20th anniversary, the world’s largest environmental foundation celebrated at the dbb Forum in Berlin. 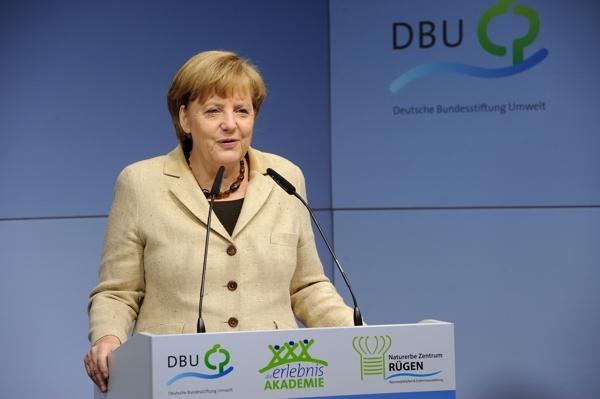 Approximately 7,800 innovative and environmentally friendly pilot projects have been supported by the Deutsche Bundesstiftung Umwelt (DBU) in the past 20 years with a funding sum of almost 1.4 billion euros. DBU is one of the patrons behind the concrete implementation of forward-looking environmental policy. The DBU used the anniversary as an occasion for a ceremony. 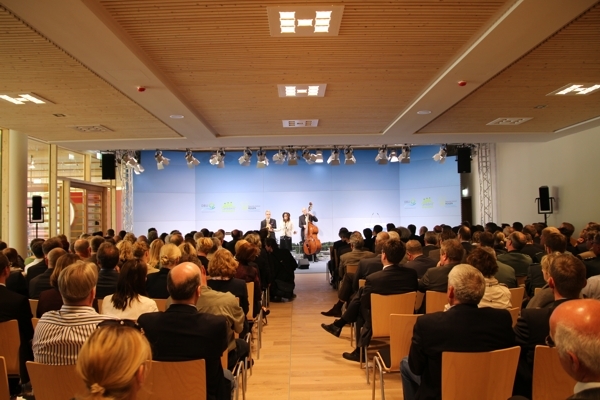 Around 400 invited guests from the worlds of politics, business, science and environmental associations looked back on the achievements and dared to look forward to future developments. ArcoStage 200 – Used for the first time! 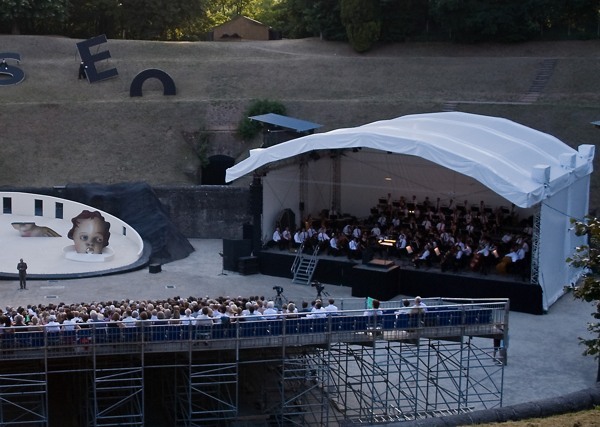 June 2010 – ArcoStage 200 is currently hosting a four-week open-air theater festival. Tragedies, dramas, an opera and a festival concert –everything under one roof thanks to our new stage flagship. The 204 square meter stage shows its strengths: white foils, a filigree design for this stage size, and as a special solution, at the request of the stage designer, a headroom of only six meters in contrast to the normal height of about ten meters. 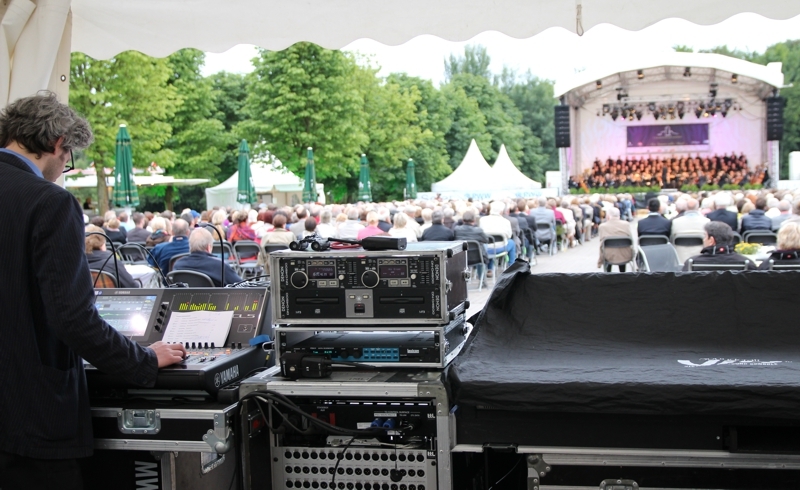 In this case, however, the stage is not used as an actual playing area, but as a weather protection and podium for the orchestra. We have also convinced our customers due to the fact that all ballast is directly integrated into the stage floor and thus lets the stage appear as a clean place and therefore, it looks great. 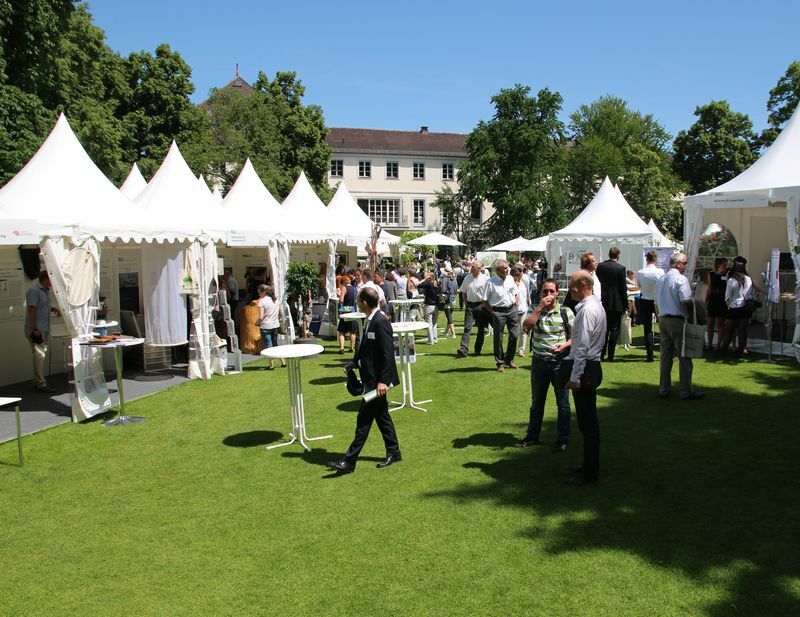 Conclusion after four weeks festival time: Thanks to flexible stage concepts, we won a highly satisfied customer! A stage with many possibilities and options that can be adapted to the requirements of the theater, classical and opera scene. 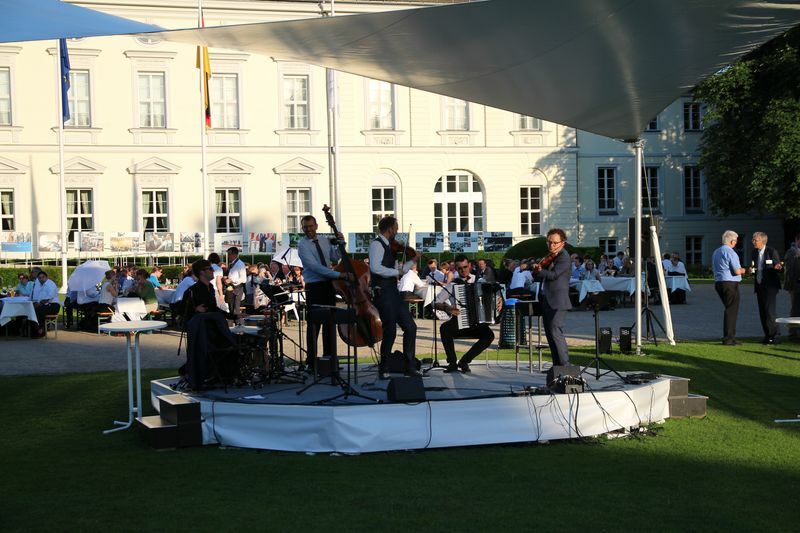 Well-known artists and musicians of the classical scene, seven different locations, partly open air, partly indoor and a total of 17 event days with over 40 acts were successfully supervised by our team. The venues were well chosen and have an attraction even without a classic event. 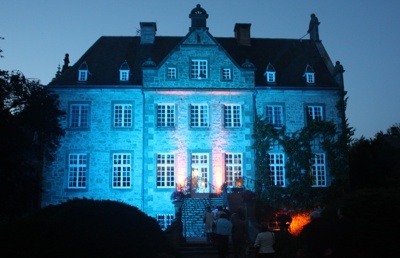 Venues such as the moated castle in Raesfeld, the airport in Paderborn, the Surenburg in Riesenbeck and the cathedral of Muenster. 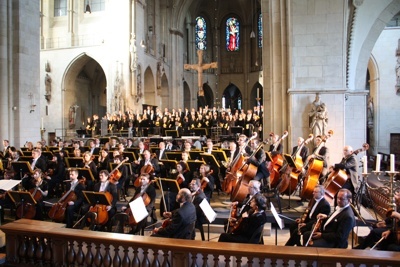 The opening concert also took place in the cathedral of Muenster. Krzysztof Penderecki conducted his composition „Die Sieben Tore von Jerusalem“. L & S built a platform for 200 musicians and singers with a total of six floors and provided lighting for the orchestra and the choirs. 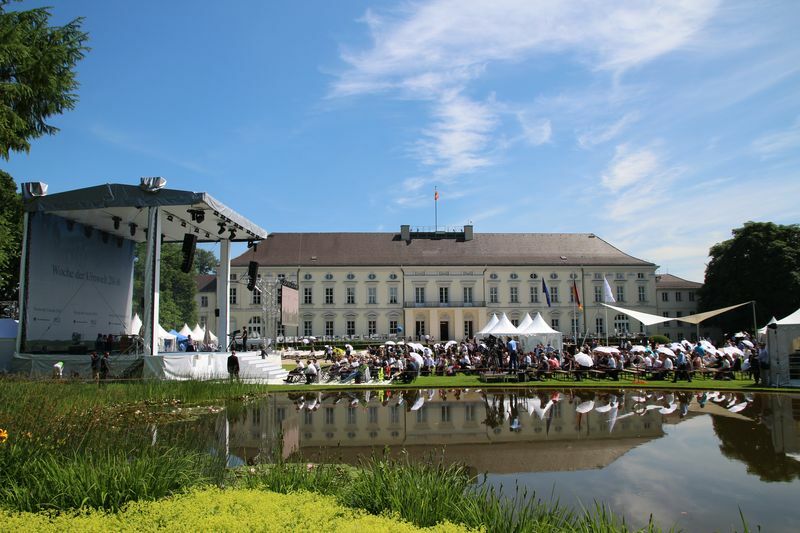 Highlight of the event series was, we suppose, the open air concert of the Royal Philharmonic Orchestra London, directed by Carl Davis in Raesfeld. For the four-day event with further concerts, we did not only provide the technical superstructure and facilities, but also tents for artist’s cloakrooms and the backstage area as well as 3,000 chairs. Our new ArcoStage 140 “Classic Edition” was used as stage. The Adamson Line-Array of the Spectrix series and microphones from AKG and Neumann provided an excellent sound. This was as well, the opinion of the organizer. 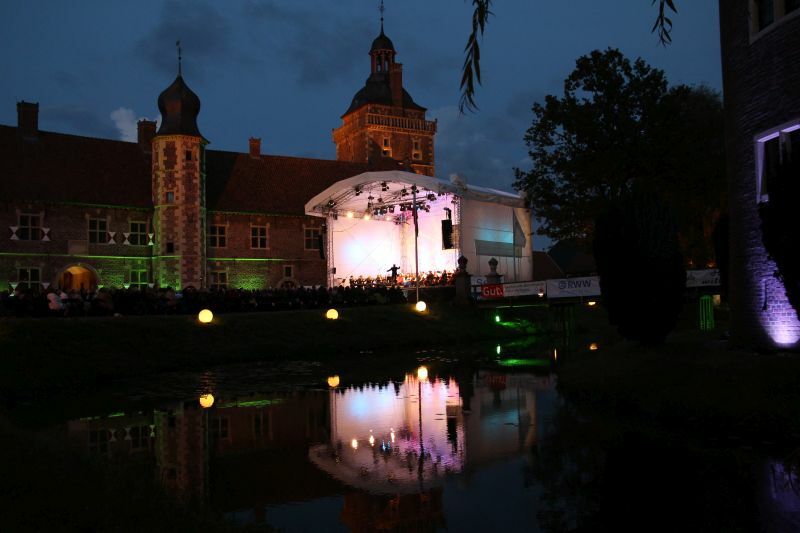 Apart from 50 theater lights, our moving lights from HighEndSystems and Kolorado outdoor spotlights were also used.